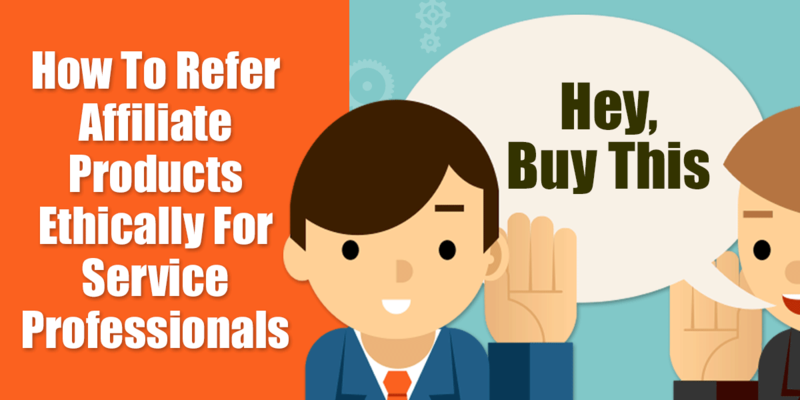 If you are a service professional doing authority marketing you may be in a quandary about how to ethically refer people to affiliate programs where you might get a cut of the action. For those of you just getting started with this idea, many companies use “affiliate partners” to sell their products or services. Functionally what this means is that they allow you to sign up as an affiliate and get a commission for recommending a product to your fan base. This can range from about 10% for services to 100% for some products (in this case the original company is doing lead generating and will be selling them things on the “back end” that you will probably not receive a commission for). I have found that MOST of the products I use and people I follow have some kind of arrangement like this. Just to let you know, this is my story of repping affiliate products and as such I do include links to products and services that I believe in. I may receive some compensation for referring you (more about disclosures below). A little back story. I had done half-hearted affiliate marketing for years starting early in my marketing career. Early on my results were definitely lackluster and sporadic (in fact one time I actually made about $80 but they slowly drained it away because I never hit the $100 where I would have been paid out). That is the lure and the problem with affiliate marketing. You can do it super easily, but to get good results you have to treat it like any other aspect of your business. If you are just throwing links around you will get weak results. It is only by having a systematized approach that you will be able to make any kind of impact on your bottom line financially. The nice thing about affiliate sales once you decide to have a formalized plan is that it becomes relatively easy to pick up a few hundred extra dollars per month just by sharing resources that you already use. I have had great results referring out many of the products that I use including my CRM software, my landing page software and the tools that I actually use in my business everyday. Which leads us to which products to refer. Because you are a service professional NOT an affiliate marketer, you need to be very careful that you do not alienate your clients or customers by trying to shove non-conforming products down their throats if they are not a good fit. For example, people ask me about marketing all the time so I recommend marketing products and resources. Occasionally someone will approach me to rep a product like jewelry because they think I have access to professional women (I do) and that it would be a good way for them to sell more jewelry (it wouldn’t). It wouldn’t be a good fit because 1) I don’t wear much jewelry and it is really not a passion for me and 2) it is incongruent with what people think my site and content will be about! Trying to sell something that is outside the scope of my expertise will stick out like a sore thumb and put people on guard when I recommend other things to them. Stick with what you know! Occasionally I get contacted by a GREAT company that has a product that is just not a great fit for me. For example, the nice Heyo people contact me often because my company LOOKS like it does social media marketing on Facebook. But I don’t. I find Facebook to be frustrating and unproductive compared with advertising on Twitter or Pinterest. And I have tried to help them (because introducing them to my email list WOULD help them), but it really is outside my scope of work right now and I don’t have the time to get up to speed enough on their product (or Facebook contests) to give them a great referral at this time. That said, most companies do offer a discount that their affiliates can give out so if you need a great contest software for Facebook, those nice Heyo people are offering a week free trial for their affiliates to give away. Try not to fall into this temptation. I would suggest that you pick 1-3 things to sell to start off and cap it at 10 affiliate products you promote. YES, I get that there are a million things you COULD promote, but if you do have 1,000 different products you will look spammy and do all of them badly. Now I am probably to the meat of why you are here…how to refer out affiliate products without looking like a dirtbag. You will be happy to know that it is super easy and not icky feeling at all! I refer products all the time (whether they have an affiliate program or not) so checking real quick to see if I could get paid a referral fee doesn’t seem yucky at all! These are in order from the most work, contact to the least. I am not sure if this is true affiliate marketing but it does work for me! JV means “Joint Venture” and it is when you do something with a complimentary company that benefits both of your businesses. For example, I did an online webinar for Home Stagers with Christine Rae of Certified Staging Professionals International. On it I talked about how to connect with Realtors. We both marketed the program and split the income. This is a great way to increase your (and their) reach while still making some money! Today I am going to start a new feature to my email list, Tuesday Tools. In it I will recommend the things that I use for my marketing AND include an affiliate link tool. Because I generally only send informational emails, I will be including a link to opt out of the Tuesday Tools. I rarely send out purely sales emails to my list, but if your list is used to that kind of message it is fine. The conversion rate when you promote an affiliate product in email is much higher than when you just do social media posts! As a service professional you can find the line between spammy emails and truly helping your clients find tools and programs that will help you! After email suggestions, the next level of commitment to affiliate product promotions is writing a blog post about it! I do this often with products that I truly enjoy using. For example, I LOVE my Leadpages for making great landing pages and opt in forms. But I hate that everyone’s “stuff” all looks the same so I wrote a blog post about how to change the look of the boring old opt in boxes. I include affiliate links in these types of posts and work to make sure that the post itself has a value! Okay, here is where I do most of affiliate promotions. Because I have grown big social media accounts that have lots of followers, I can send out regular messages that promote products. One of the main things I like to promote is upcoming webinars and trainings for people who I know, like and respect. For example, I will promote Chris Brogan’s webinars EVERY time because I get such value from them myself! Know your social site. That said, you can’t post the same on every site. I have multiple Twitter accounts that are targeted to specific industries (like EbookNerds for authors). On these Twitter accounts I post things that are current and have a deadline. On Pinterest I like to post things that are “evergreen”, meaning that they are not going to run out anytime soon. If I put a ton of links to expired stuff on Pinterest I would not get very much love for my account or my suggestions overall! I post links on LinkedIn, Facebook pages and Google+ too! Using your social accounts to promote affiliate marketing products is a great way to help monetize some of that time you are spending (wasting) doing social media. My marketing resources page received 138 hits in the last month. Having it in the top navigation of my site as well as in the sidebar of my blog area increases the likelihood that someone will want to visit it and click through to one of the affiliate links. While this is a super passive way to get sales, it is totally congruent with my business as I list resources that I develop as well as the ones that I use actively in my business daily. Years ago you could include affiliate links in your emails and website without stating that you were receiving compensation. Those days are gone and according to FTC Guidelines, you now must state prominently that you are including an affiliate link and that you might receive payment for your recommendation. I have not found this to be a problem in my recommendations (I even wrote a post about it! My FTC Disclosures are Ridiculous and Out of Hand). Just be open and up front about what you are recommending and if you are getting paid! I have been doing affiliate marketing for years and I have never had anyone respond that they are mad that I included an affiliate link in my messages or posts.